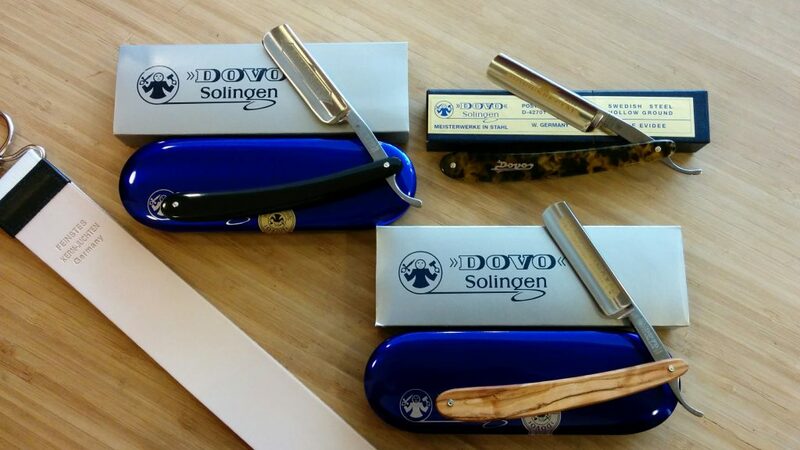 Just back from honing: A fresh batch of Shave Ready Straight Razors from Dovo of Solingen, Germany! A note about the term “Shave Ready”: Regardless of the brand, the factory edge on a brand new straight razor is pretty crude and is nowhere near sharp enough to give you a proper shave. That’s why, unlike some other retailers, we ALWAYS send our new straight razors out for professional honing and stropping before we offer them for sale. It costs us a bit more (in both time and money) but it has to be done if the razor is to perform the way it was intended to. The razors shown in the picture range in price from $200 to $270. Shop early for best selection – when the current batch is gone, it will be at least another 3 to 4 weeks before we have replacements. Cheers!